Definitions of some terms and phrases of use in the RAC industry. distractions and junk diversions that conspire to wreck almost all Internet searches today. In many cases this collection of definitions also includes their origins. Thus celebrating the lives of the uniquely European engineers, mathematicians, physicists and scientists who worked tirelessly laying down the foundations of science and engineering that shaped the modern world we enjoy living in today. Absolute pressure is zero-referenced against a perfect vacuum, so it is equal to gauge pressure plus atmospheric pressure. Also called the Kelvin temperature scale. Absolute temperature is measured in kelvins and rarely now degrees Rankine. Absolute zero is 0 K or 0 °R (-273.15 °C or -459.67 °F). In thermodynamics, an adiabatic process is one that occurs without transfer of heat or mass of substances between a thermodynamic system and its surroundings. In an adiabatic process, energy is transferred to the surroundings only as work. Air boundary layer is used to describe the phenomenon that materials 'entrain' a shallow region of air close to their surfaces. Although on exposed construction materials, prevailing winds will disturb this layer (changing airflow pattern from laminar flow to turbulent flow) it is nonetheless important to consider its beneficial insulating effects, particularly when materials with intrinsically high heat transfer coefficients (poor thermal insulators) are under consideration. That it always occurs is a certainty, it is however often ignored because it has little effect when included in calculations involving well insulated composite material walls and because of the extra complex work involved in manual calculations. With the advent of advanced computer programs however there can be no excuse for not including these calculations. Albedo is the diffuse reflectivity or reflecting power of a surface. It is the ratio of reflected radiation from the surface to incident radiation upon it. Its dimensionless nature lets it be expressed as a percentage and is measured on a scale from zero for no reflection of a perfectly black surface to 1 for perfect reflection of a white surface. Since it is the ratio of all reflected radiation to incident radiation it will include the diffuse and the specular radiation reflected. It is, however, common to assume a surface reflects in either a totally specular manner or a totally diffuse manner, as this can simplify calculations. Albedo depends on the frequency of the radiation. When quoted unqualified, it usually refers to some appropriate average across the spectrum of visible light. In general, the albedo depends on the directional distribution of incident radiation, except for Lambertian surfaces, which scatter radiation in all directions according to a cosine function and therefore have an albedo that is independent of the incident distribution. In practice, a bidirectional reflectance distribution function (BRDF) may be required to accurately characterize the scattering properties of a surface, but albedo is very useful as a first approximation. The albedo is an important concept in climatology, astronomy, and calculating reflectivity of surfaces in LEED* sustainable-rating systems for buildings. The average overall albedo of Earth, its planetary albedo, is 30 to 35% because of cloud cover, but widely varies locally across the surface because of different geological and environmental features. * LEED Leadership in Energy and Environmental Design. When walls or exposed roofs (either flat or pitched) are selected then the colour (and hence reflectance values) may also be defined by clicking on the Define Colour buttons in both the Wall Details and the Ceiling Details forms. Scientifically, varying reflectance as a function of surface colour is described under the phenomenon known as albedo factor. Parts (but not all) of this explanation were obtained from Wikipedia. All rights, if any, are acknowledged (where Wikipedia's author and contributor obtained it from is unknown). Ambient (air) The word ambient literally means ‘all surrounding’. In the context of air, ambient air, often abbreviated to just ambient, means the air that surrounds us, including in the wider sense, the properties of that air. Generally therefore ambient air is that which is outside or external to air that might subsequently be treated or ‘conditioned’, as in air conditioning. The basic unit of electrical current in the International System of Units (SI), equivalent to one coulomb per second, formally defined to be the constant current which if maintained in two straight parallel conductors of infinite length, of negligible circular cross section, and placed one metre apart in vacuum, would produce between these conductors a force equal to 2 × 10 -7 newton per metre of length. Abbreviations: A, amp. 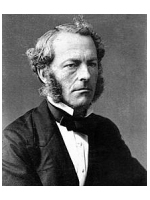 The SI unit of measurement of electric current, the ampere, is named after the eminent French physicist and mathematician André-Marie Ampère and who is generally regarded as one of the main founders of the science of classical electromagnetism. Which André-Marie Ampère appropriately described as "electrodynamics". In Physics. The absolute value of the maximum displacement from a zero value during one period of an oscillation. In Electricity. The maximum deviation of an alternating current from its average value. Anisotropy - directional dependence of measured properties such as thermal conductivity; the condition of a material having different properties in different directions. Examples of an anisotropic material for heat conduction are laminated materials (composed of layers with different thermal conductivity), having different thermal conductivity perpendicular and parallel to the layers. The standard atmosphere (symbol: atm) is a unit of pressure equal to 101325 Pa or 1013.25 millibars or hectopascals. It is equivalent to 760 mmHg (torr), 29.92 inHg, 14.696 psia, 33.94 ft of water. An azeotrope or azeotropic mixture is a mixture of two or more liquids where its components cannot be altered simply by distillation. This is because when an azeotrope is boiled the vapour has the same proportions of constituents as the unboiled mixture. The components of azeotropic mixtures will not separate under normal operating conditions and can be charged as a vapour or as a liquid. For purposes of navigation, meteorology and in engineering solar azimuth is the arc of the horizon measured clockwise from the north point to the point where a vertical circle through the sun intersects the horizon. An important component in any computer or manual calculation of solar radiation heat gains upon exposed surfaces of stuctures for puposes of overall heat load calculations. Refrigeration system component balance point is the set of temperature and pressure conditions at which two or more major component parts of a closed cycle refrigeration system share to result in a precise predicted performance. For reasons of expediency, clarity and comparison, manufacturers of major items of 'capital equipment' for application in refrigeration systems are obliged to publish performance data for their products at what is described as 'nominal conditions'. In an ideal world all manufacturers would publish their product data at identical nominal conditions. Thus making performance, cost and value comparisons simpler for those involved in commercial and engineering decision processes. Although much has been done over recent years, particularly under pressure from government bodies concerned with fair trade practices, total harmony across the industry has not yet been achieved. For Standard Condition 1 (SC1) room temperature (RT and generally considered to be equal to air on coil temperature) of 10°C against refrigerant evaporating temperature (or Saturated Suction Temperature) of 0°C, giving a TD (temperature difference between the two of 10 Kelvin. For Standard Condition 2 (SC2) room temperature (RT and generally considered to be equal to air on coil temperature) of 0°C against refrigerant evaporating temperature (or Saturated Suction Temperature) of -8°C, giving a TD (temperature difference between the two of 8 Kelvin. For Standard Condition 3 (SC3) room temperature (RT and generally considered to be equal to air on coil temperature) of -18°C against refrigerant evaporating temperature (or Saturated Suction Temperature) of -25°C, giving a TD (temperature difference between the two of 7 Kelvin. For Standard Condition 4 (SC4) room temperature (RT and generally considered to be equal to air on coil temperature) of -25°C against refrigerant evaporating temperature (or Saturated Suction Temperature) of -31°C, giving a TD (temperature difference between the two of 6 Kelvin. The above standard operating conditions are convenient as they are either close or even identical to many actually required 'real life' operating conditions. Particularly SC3 which is commonly used for General Purpose Freezer rooms for example. Notwithstanding the fact that engineers will frequently need to calculate predicted performances at conditions varying from published standard conditions, by the simple application of published 'correction factors', this still does not provide a completely accurate statement of predicted performance, as further complications of how major system components, and which can inevitably be sourced from different manufacturers, will perform when used together in the same system. This is because selection and matching of components to work together in the system can never be the same across all operating conditions. 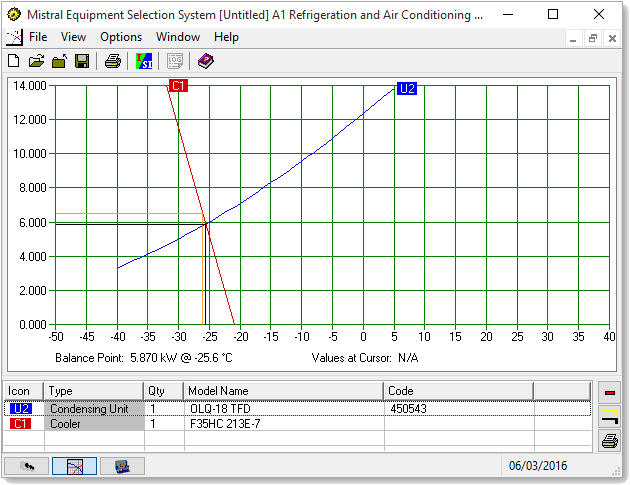 The number of variables involved viz Required duty, peak ambient air temperature, room design temperature, desired TD and hence refrigerant evaporating temperature, refrigerant type etc., mean that whilst an evaporator might be matched ideally to a condenser or condensing unit at one set of operating conditions, inevitably it will need to be matched to a completely differently performing condenser or condensing unit at another set of operating conditions. The major complications then arises that the set of operating conditions for the optimal and commercially readily available components will affect the performance of each other so as to differ from mathematically predicted performances for each component. Thus the Balance Point needs to be determined and which will more accurately indicate predicted total system performance (duty). Plotting a Balance Point accurately can however be time consuming and regrettably therefore it is often neglected. Particularly by inexperienced practitioners. Whilst good computer programs have been developed to both speed the process and to improve its accuracy these should not be used as a substitute for understanding the Balance Point process and how to apply it. A Ball Valve uses a spherical obstruction to stop and start hydraulic flow. A ball valve is usually rotated through 90° to open and close it. The bar is a non-SI unit of pressure, defined by the IUPAC as exactly equal to 100,000 Pa. It is about equal to the atmospheric pressure on Earth at sea level, and since 1982 the IUPAC has recommended that the standard for atmospheric pressure should be harmonised to 100,000 Pa = 1 bar ˜ 750.0616827 Torr. The same definition is used in the compressor and the pneumatic tool industries (ISO 2787). 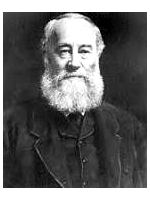 The bar and the millibar were introduced by the British meteorologist William Napier Shaw* in 1909, while he was the director of the Meteorological Office in London. Units derived from the bar are the megabar (symbol: Mbar), kilobar (symbol: kbar), decibar (symbol: dbar), centibar (symbol: cbar), and millibar (symbol: mbar or mb). They are not SI or cgs units, but they are accepted for use with the SI. The bar is legally recognised in countries of the European Union. Bar(g) is a unit of gauge pressure, i.e., pressure in bars above ambient or atmospheric pressure (see absolute pressure and gauge pressure). A body that absorbs all radiation falling on it and emits electromagnetic waves with spectrum given by the Planck's law. The temperature at which a fluid changes from a liquid to a gas (vapour). At atmospheric pressure water boils at 100°C (212°F). A modern version or paraphrase states Boyle's Law as - The absolute pressure exerted by a given mass of an ideal gas is inversely proportional to the volume it occupies if the temperature and amount of gas remain unchanged within a closed system. Mathematically, Boyle's Law can be stated as:- PV = k, where P is the pressure of the gas, V is the volume of the gas, and k is a constant. Thus, as volume increases, the pressure of the gas decreases in proportion. Similarly, as volume decreases, the pressure of the gas increases. Boyle's Law was named after the English chemist and physicist Robert Boyle who first published it in 1662. Born Lismore Castle, Ireland, 1627. Brazing is a process in which two or more metal items are joined together by melting and flowing a filler metal into the joint between two or more close-fitting parts by capillary action. The filler metal is brought slightly above its melting temperature while protected by a suitable atmosphere, usually a flux. It then flows over the base metal in a process called wetting and then cooled to join the workpieces together. Brazing is similar to soldering except the temperatures used to melt the filler metal are higher for brazing. Brazing differs from welding in that the process does not involve melting the metals to be joined. The British Standard Pipe (BSP) is a range of standard screw thread types used internationally to connect pipes by mating an external (male) with an internal (female) thread. BSP has been adopted as an international standard scale used in steel, brass, ABS (plastic) and other plastic and metal pipe fittings, except in the USA where NPT is used. Jointing threads. Pipe threads where a pressure tight joint is made through the mating of two threads together. They always use a taper male thread, but can have either parallel or taper* female threads. * Except for International standards where all female threads must be parallel. Longscrew threads. Pipe threads where a pressure tight joint is made by the compression of a soft material (such as a butyle rubber O-ring seal or washer) between the end face of the male thread and a corresponding landing surface in the matching socket. The thread form is British Standard Whitworth. Pipe sizes are described by their nominal inside diameter in inches (a legacy of the old Imperial measurement unit system and which persists for BSP). However, as manufacturing quality and consistency has improved, coupled with greater understanding and application of application pressure limits, as a cost saving exercise, pipe wall thicknesses have reduced since the original 19th century standards were introduced. Being impractical to change outside connection standards the inside diameters have subsequently been slightly increased for each given standard BSP size. Died Monte Carlo, Principality of Monaco, 1887. The British thermal unit (BTU or Btu) is a traditional unit of energy approximately equal to 1055 joules. It is the amount of energy needed to cool or heat one pound of water by one degree Fahrenheit. Except for the USA where it still largely persists, in science and industry the joule, the SI unit of energy, has generally replaced the BTU. Random motion of particles in a liquid or a gas due to thermal excitation. 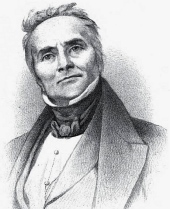 Robert Brown, Scottish Botanist, was the first to describe this phenomenon in 1827. The temperature at which a liquid forms bubbles (usually the lower or lowest boiling point of one of the constituents of a blend). The liquid temperature without sub-cooling. The word calorie was used to describe two units of energy. The small calorie or gram calorie (symbol: cal) is the approximate amount of energy needed to raise the temperature of one gram of water by one degree Celsius. The large calorie, kilogram calorie, dietary calorie, nutritionist's calorie, nutritional calorie or food calorie (symbol: Cal, equiv: kcal) is the amount of energy needed to raise the temperature of one kilogram of water by one degree Celsius. The large calorie is thus equal to 1000 small calories or one kilocalorie (symbol: kcal). Although these units are part of the metric system, they now have been superseded in the International System of Units by the joule. One small calorie is approximately 4.2 joules. One large calorie or kilocalorie is therefore approximately 4.2 kilojoules. A capillary tube or tubes are fitted at the end of refrigerant liquid lines in closed circuit, direct expansion, refrigeration systems immediately before the evaporator so as to maintain high pressure in the liquid line at the same time as facilitating a significant pressure drop as the refrigerant enters the evaporator, thereby forcing the refrigerant to evaporate and absorb heat from surrounding fluids and materials. Thus creating a cooling effect. Pressure differential through the capillary tube is a function of the tube length and relatively small diameter creating a measurable, constant resistance to refrigerant flow. Capillary tubes are also effectively metering devices, controlling the rate of flow of refrigerant circulating through the closed circuit refrigeration system. They have a similar effect as more sophisticated expansion valves and thermostatic expansion valves but lack the advantages afforded by the latter of variable control. Capillary tubes are less expensive components for their purpose than expansion valves and are generally more suited to smaller refrigeration and cooling applications, especially where refrigeration load duties are predictably more constant. In domestic refrigerators and automotive air conditioning systems for example. Where multiple capillary tubes are required (for multi-circuit evaporators) then these will be fitted by brazed connection to a precision made brass component called a distributor and where the capillaries are arranged symmetrically so as to ensure each tube receives and passes identical volumes of refrigerant. Modern replacement of the Fahrenheit scale. The conversion is Tf = (9/5)*Tc+32 where Tc = temperature in degrees Celsius, Tf = temperature in degrees Fahrenheit. 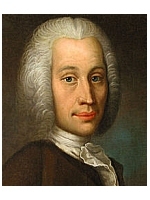 The Celsius temperature scale was named after Anders Celsius, Swedish astronomer, physicist and mathematician. 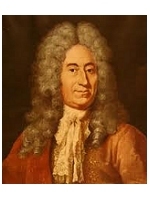 Professor of astronomy at Uppsala University from 1730 to 1744. Anders Celsius proposed the Celsius temperature scale in 1742. Centigrade is essentially the same temperature scale as Celsius but with slight differences. Originally concerning itself mainly in the temperature range associated with the freezing point of pure water (0°C) and the boiling point (100°C). Hence the 'centi' component in the word (meaning 'one hundred' or parts thereof). The centigrade scale is divided into degrees, based on dividing the temperature between which water freezes and boils, into 100 equal gradients (degrees). The centigrade scale was introduced in 1744 and remained the primary scale of temperature until 1948. In 1948 the CGPM (Conference General des Poids et Measures) began to standardise several units of measurement, including the temperature scale. As 'grade' was already in use as a unit in its own right, the new name Celsius was chosen for the temperature scale. Thus Centigrade has largely fallen into disuse, except in meteorology. The Celsius scale remains a centigrade scale in which there are 100 degrees from the freezing point (0°C) and boiling point (100°C) of water, though the size of the degree used in the Celsius scale is now more precisely defined. A degree Celsius (or a Kelvin) is a division of the thermodynamic range between absolute zero and the triple point of pure water into 273.16 equal parts. There is 0.01°C difference between the triple point of water and the freezing point of water at standard pressure. Chlorofluorocarbon. Saturated hydrocarbons in which all of the hydrogen atoms in the molecule have been replaced by chlorine and fluorine atoms. CFCs are identified by a two or three digit number with each digit representing the number of particular atoms in the compound. CFM (cfm or cubic feet per minute) is used in measurement of volumetric flow rate in the old Imperial system of units. It is equal to 0.028317 cubic metres per minute and 1,699011 cubic metres per hour in SI units. A Check Valve is a control valve that allows fluid to flow in one direction only. Check valves prevent fluid backflow. The chemical potential of a thermodynamic system is the amount by which the energy of the system would change if an additional particle is introduced, with the entropy and volume held fixed. If a system contains more than one species of particle, there is a separate chemical potential associated with each species, defined as the change in energy when the number of particles of that species is increased by one. The chemical potential is particularly important when studying systems of reacting particles. A compressor is any reciprocating or rotating mechanical device that compresses a gas. The design and configuration of which can take many forms. Some of the more commonly found varients are described below. Centrifugal compressors use a rotating disk or impeller in a shaped housing to force gas to the rim of the impeller thus increasing the velocity of the gas. A diffuser section converts this velocity energy to pressure energy. Centrifugal compressors are primarily used for continuous, stationary service in industry and larger applications. Typically from 100 horsepower to many thousands of horsepower. With multiple staging Centrifugal compressors can also achieve very high output pressures of 10,000 psi (69 MPa) or more. Hermetic compressors comprise a compressor and motor enclosed in a single, hermetically sealed, welded steel casing and where the two are connected by a common shaft. Compressors can typically be of reciprocating, vane or scroll types. Advantages over conventional (and usually larger) 'open' type compressors are compactness, ease of installation, relatively quiet operation and long service life (reliability, particularly in small applications such as domestic refrigerators and freezers). Disadvantages are that in the event of failure through wear in either of the two major components, the compressor or the electric driving motor, repair (in other than factory controlled remanufacturing conditions and where high unit production volumes normally prevail) is not usually economically viable. Despite this, in some third world countries, particularly those able to exploit cheap labour and where quality control and customer after care is poorly regarded, then some hermetic compressor repair workshops do flourish. Scroll compressors are mechanical devices for compressing air or refrigerant. Scroll compressors are used in refrigeration equipment as well as for other applications such as air compressors and vacuum pumps. Scroll compressors use two interleaved spiral-like vanes to pump or compress gases. The vane geometry may be involute, archimedean spiral, or hybrid curves. One of the scrolls is usually fixed while the other orbits eccentrically without rotating. Thus both pumping and compressing pockets of gas between the scrolls. Due to minimal clearance volumes between the fixed scroll and the orbiting scroll, scroll compressors have very high volumetric efficiency. Scroll compressors are known for operating more smoothly, quietly, and reliably than conventional reciprocating compressors of comparable duty. Reciprocating compressors use pistons driven by a crankshaft to compress gases. Reciprocating compressors can be single or multi-staged and typically driven by electric motors or coupled to internal combustion engines. Reciprocating compressors can be of the hermitic (hermetically sealed), semi-hermetic or open type. Rotary screw compressors use two meshed rotating positive-displacement helical screws to force gas into a smaller volume. Rotary screw compressors are usually used for continuous operation in commercial and industrial applications. Rotary screw compressor applications can be from a few horsepower to over 1,200 horsepower and from low pressure to moderately high pressure (greater than 1,200 psi or 8.3 MPa). In semi-hermetic compressors the compressor and motor driving the compressor are integrated, and operate within the pressurised gas envelope of the system. The motor is designed to operate in and be cooled by the refrigerant gas being compressed. Unlike the hermetic compressor however the motor is generally mounted to the hermetically sealed component containing the compressor through a gasketed seal and through which it drives the compressor via a shaft. The motor is thus made easily accessible for repair or replacement. Semi-hermetic compressors are used typically for medium sized applications, larger than where hermetic compressors are used but where there might be some overlap (around 15hp to 30hp). In duty by duty comparisons semi-hermetic compressors will normally be considered more robust or have a longer service life but also initially more expensive. Vane compressors (sometimes described as Rotary Vane compressors) consist of a rotor with a number of sliding blades inserted in radial slots in the rotor. The rotor is mounted offset in a larger housing that is either circular or sometimes a more complex shape. As the rotor turns, blades slide in and out of the slots whilst maintaining contact with the outer wall of the housing. A series of decreasing volumes is therefore created by the rotating blades. Vane compressors can be single or multi-staged and driven by either electric motors or internal combustion engines. Vane compressors are well suited to electric motor drive and are significantly quieter in operation than equivalent reciprocating piston compressors. The Critical Point (Pc) is the condition at which liquid and gas densities are the same. Above this point distinct liquid and gas phases do not exist. There is no phase change when heat is removed from a transcritical fluid while it is above the critical pressure and temperature. The Triple Point (Pt) is the condition at which solid, liquid and gas co-exist. Below this point there is no liquid phase. At atmospheric pressure solid CO2 sublimes directly to gas. 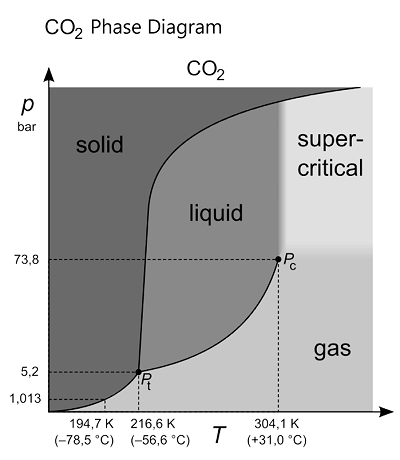 If CO2 is at a pressure higher than the triple point and its pressure is reduced to below that of the triple point it will deposit directly to a solid. The pressure in a CO2 supply cylinder is approximately 57 bar ( 5.7 MPa) at 20°C. When CO2 is withdrawn from the cylinder through a regulator set at an outlet pressure of less than 5.2 bar gaseous CO2 is produced. 1 kg of liquid CO2 expands to approximately 550 litres of gas at atmospheric pressure. The Coanda effect is the tendency of a jet of air or other fluid to be attracted to nearby surfaces that are parallel or approximately parallel to the jet stream. Named after the Romanian aerodynamics engineer Henri Coanda. A heat exchanger on the high pressure side of a closed cycle refrigeration system in which refrigerant condenses while rejecting heat to a cooling stream (Eg. ambient air). The quantity of heat that passes in unit time through unit area of a material or system when its opposite faces differ in temperature by one degree. The quantity of heat transmitted, due to unit temperature gradient, in unit time under steady conditions in a direction normal to a surface of unit area, when the heat transfer is dependent only on the temperature gradient. (See also apparent or effective thermal conductivity.) Note: there are a number of qualifiers regarding this term due to the fact that heat is not transmitted by conduction processes alone. Energy can neither be created nor destroyed, it simply changes its form. In thermal radiation terms this translates to: a + r + t = 1 where a = absorptivity, r = reflectivity, t = transmissivity. Putting a thermometer in contact with the measured object - see also Non-contact thermometry. Coefficient of Performance. A measure of the efficiency of a refrigeration system. The COP is defined as the ratio of the cooling duty of a mechanical refrigeration system compared to the power required to operate it. Eg. If a system has a cooling duty of 150kW and it requires 75kW of power to operate it then the COP is 2. It is important to be aware of the difference between Cycle COP and System COP as both are frequently quoted often without due regard to clarifying the difference. Cycle COP refers to efficiency ratio between only the compressor in the system and system performance whereas System COP includes not only the compressor but also all other power consuming components in the system such as fans and pumps etc. The temperature above which gas cannot be liquefied, irrespective of pressure. Conventional refrigeration cycles can only operate efficiently using fluids well below critical temperature. Cryogenics is the branch of physics concerned with the production and behaviour of materials at very low temperatures. Defined as temperatures below -150°C or 123 Kelvin (-238°F). An atomic force microscope that can operate at very low temperatures of several kelvins. The time rate of flow of electric charge, in the direction that a positive moving charge would take and having magnitude equal to the quantity of charge per unit of time. Current is measured in amperes. Symbols: amps, A or a. In fluid dynamics, the Darcy–Weisbach equation is used to calculate head loss, or pressure loss, due to friction along a given length of pipe relative to the average velocity of the fluid flow. The equation is named after Henry Darcy and Julius Weisbach. Henry Philibert Gaspard Darcy. French engineer. 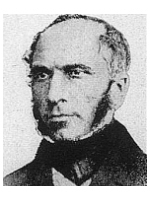 Henry Darcy made several important contributions to hydraulics including the original equation used for calculating pressure loss of fluids moving in pipes. The equation was subsequently refined by German mathematician and engineer, Julius Ludwig Weisbach. 1. Coordinates of the Sun in the ecliptic coordinate system. 2. Convertion to the equatorial coordinate system. 3. Convertion to the horizontal coordinate system for the observer's local position. An important component in any computer or manual calculation of solar radiation heat gains upon exposed surfaces of stuctures for puposes of overall heat load calculations. As for example in air conditioning heat load calculations. Defrost system Eg 'Time-on, time-off' and 'Time-on, temperature-off'. A system, either mechanical through use of liquid or refrigerant gas, or electrical through use of electrically heated elements, for removal of unwanted ice build-up on the surfaces of evaporators in refrigeration systems. The defrost mechanism heats the evaporator for short periods of time to melt ice that has formed upon it and which if not removed will both impede performance and also restrict airflow in the case of evaporator fan-coil units. The resulting melt water either drains through a pipe in the base of the evaporator (drain pan) or is pumped from the unit. Defrosting is typically controlled by an electronic timer set to provide defrosting at regular preset intervals. Excessively or uneccessarily long defrosting periods are undesirable however due to undesired introduction of heat into cooled spaces and resultant obvious cost considerations. Therefore more sophisticated defrost cycle termination switches have been developed than simple 'timer initiated termination'. Such as 'Time-on, temperature-off' and even electronic ice sensing systems utilising photo-voltaic components for example. An electrical or electronic device for initiating and sometimes terminating defrost intervals in coldrooms and freezers. In simple systems defrost cycles may be of the 'time initiated, time terminated' type. However these can lead to wasted energy due to the dual effects of unnecessarily long defrost periods and also, for freezers, the additional burden of adding excessive amounts of heat energy (from the defrost system) into the refrigerated space. More sophisticated systems described as 'time initiated, temperature terminated' and related systems employing actual ice presence detectors (typically utilising photo-voltaic apparatus) are increasingly being used to terminate defrost periods. A desiccant is an hygroscopic chemical or substance often used to remove excessive or unwanted moisture from an object or from a conditioned space. De-humidification is the process whereby excess or unwanted moisture is removed from an object or a conditioned space. De-humidification can be achieved, particularly for small objects such as moisture vulnerable intricate electrical devices, by use of a chemical desiccant or de-humidification can be achieved by cooling air to below its dew point, with the result that moisture will condense and can thus be removed, then re-heating the air to a higher desired temperature and now with a subsequently lower moisture content. The difference in temperature between two different substances operating commonly in a system. For example:- Where water enters a heat exchanger at 30°C to cool oil leaving at 50°C Delta TD is 20 Kelvin. The difference in temperature between a substance entering a system and after heat energy has been either removed or added, subsequently leaving that system. For example:- Where water enters a heat exchanger at 30°C to cool oil leaving at 50°C and the water leaves the heat exchanger at 40°C Delta T is 10 Kelvin. Symbol r (Greek rho) - is a measure of mass per unit of volume. The higher an objects density, the higher its mass per volume. The average density of an object equals its total mass divided by its total volume. Bulk density is a term for density of a collection of particles (eg grains of sand) in a container, as opposed to the material density that is the density of the individual particles (eg one grain of sand). The temperature at which a vapour will condense or, where associated with glide, the highest boiling point of a component in the mixture. Vapour temperature without any superheat. A Diaphragm Valve is a valve that uses a flexible diaphragm, usually of rubber, synthetic rubber or plastic material, which engages with an orifice via the operation of a screw mechanism for example, to control fluid flow. Differential pressure is the difference in pressure between two measured pressure points. To evenly distribute flow of air in a desired direction. To enhance mixing of air from various sources prior to being discharged. To encourage air streams to adhere to a ceiling or other surface. taking advantage of the Coanda effect. To create low velocity air movement in occupied parts of rooms where higher velocities would lead to discomfort. To help reduce the amount of noise resulting from turbulence of air streams that are forced to rapidly change in velocity upon entering a space or room. A Direct Expansion refrigeration system, commonly abbreviated to the initials DX, is a mechanical system designed to produce a cooling effect upon a fluid (typically air or water) which exploits directly the heat energy absorbed during the change of state process that results from evaporation of a liquid (refrigerant) into a vapour. A Direct Expansion refrigeration system is commonly found in many both air condoning systems and also (primarily) domestic refrigerators, freezers and commercial sized refrigeration systems. The system comprises a closed pipe circuit connecting three principal components. These are :- An evaporator, where expansion of relatively volatile refrigerant liquid is encouraged to evaporate, in the process absorbing heat energy from air in b>direct contact with the evaporator, a compressor where following expansion the resultant refrigerant vapour is compressed, and a condenser where the relatively hot, compressed refrigerant vapour is cooled via a cooling medium stream such as ambient air or water, forcing it to condense back into a liquid refrigerant. The refrigerant circulates continuously through the closed circuit system due to the dual role of the compressor in both compressing and also effectively pumping the refrigerant around the circuit. Alternative descriptions sometimes applied to the same system are Vapour Compression Cycle and Closed Circuit Refrigeration System. The temperature of air as indicated by an ordinary thermometer. Nitrogen is an inert gas. Nitrogen where moisture content has been removed to a measured dew point of -40°C (-40°F) is commercially readily available as it is produced for many industrial drying purposes and for medical use, where it is known as 'White Spot Dry Nitrogen'. Oxygen impedes the joining of non ferrous components during brazing operations and therefore Dry Nitrogen can be introduced into pipes that are to be brazed, a process known as 'purging' so as to exclude oxygen and thus aid the brazing process and also prevent the formation of potentially damaging oxides on internal surfaces of pipes. Manufacturers of fin and tube heat exchangers routinely use White Spot Dry Nitrogen purging during their production systems for both manual and automated brazing processes. Fin and Tube heat exchangers, particularly for oem (original equipment manufacturing) applications for relatively high volume assembly production lines such as for automotive air conditioning, are routinely sealed and charged prior to despatch from the heat exchanger manufacturing plant with a low positive charge of White Spot Dry Nitrogen. Thus ensuring the product remains internally free of moisture during transport and storage, regardless of varying ambient conditions. The sound or other indicator warning of nitrogen escaping from the product when the temporary seal is removed also serves to provide evidence that the product has remained gas tight between manufacture and arrival at the assembly operation. For refrigeration and air conditioning systems, particularly those having roof mounted condensers, and that may be expected to operate from time to time at well below their peak or maximum load conditions, or where capacity control is provided by cycling compressors in multiple compressor packs, single refrigerant risers may result in suction velocities that are too low to effect proper oil return. A double riser suction line can be installed in such situations and this typically comprises a smaller and larger riser. The smaller of the two must have sufficient section to cope with the minimum expected load and the sum of the pressure drops of the larger and smaller risers must be equal to that of the equivalent single riser that would be used to cope with the system running at full capacity. The larger riser is trapped and its utilisation controlled so as to come into use only when the system is running at full capacity. Thereby acceptable velocities for effective oil return can be achieved across the whole expected range of system capacities. A colouring substance which can be natural or synthetic. Dye molecules absorb and emit light within a specific range of wavelengths, thus they appear to have a certain colour. Electronically Commutated motors are effectively a type of brushless DC motor. Basic DC motors rely upon carbon brushes and a commutation ring to switch the current direction, and therefore magnetic field polarity, in a rotating armature. The interaction between this internal rotor and fixed permanent magnets induces its rotation. In an EC motor, the mechanical commutation has been replaced by electronic circuitry which supplies the right amount of armature current in the right direction at precisely the right time to effect accurate motor control. The electronics in an EC motor converts AC to DC and control motor speed by regulating power supplied to the motor. Apart from introducing fine motor speed control manufacturers claim efficiency improvements of up to 30%. The emissivity of a surface is the ratio of the energy radiated from it to that from a blackbody at the same temperature, the same wavelength and under the same viewing conditions. The term "emissivity" has a lot of qualifiers, depending on wavelength and direction of emission or detection. For instance, "normal spectral emissivity" indicates the emissivity at a particular wavelength and in a direction normal to the surface, while "hemispherical total emissivity" indicates emissivity when radiation is emitted over all wavelengths into all of the space above a material surface. The term "emittance" is often used instead of emissivity. This is to distinguish the emissivity of a particular sample of material from the 'characteristic' value of the material when it has an optically smooth surface and is thick enough to be opaque. However, it is almost impossible to achieve the latter condition in practice and so this terminology is not universally adopted. Emittance or emissivity of a material is the ratio of the radiant heat flux emitted by the material to that emitted by a blackbody at the same temperature and under the same viewing conditions. (See radiant heat flux.) Note: there are four qualifiers that apply, namely, directional, hemispherical, spectral and total, depending on direction and wavelength range, respectively. Derived from or relating to experiment and observation rather than theory. Based on practical experience rather than scientific proof. Empirical data was the original basis for all scientific research and continues to be of indespensible value today. However mid 20th century emergence of computing technology has resulted in accelerating research to obtain scientific proofs and also mathematical modelling methods where digital application of empirical data is both clumsy and impractical. Particularly for essential 'dynamic error trapping' processes without which many computer programs would be rendered all but useless. The cost of converting empircally based data into algorithms, formulae and equations thus represents a significant part of that required to develop viable computer software (programs) and which are now essential for commercial and industrial etc., efficiency. A process that requires heat from its surroundings. Enthalpy is a measure of the total energy of a thermodynamic system. It includes the system's internal energy, which is one of five common thermodynamic energy potentials and a state function, as well as its volume and pressure. Entropy quantifies the degree of disorder in a closed system and the probability of a reaction taking place or not. In a closed system entropy increases until the equilibrium is reached. The thermodynamic definition of entropy reflects the fact that heat cannot be completely converted into work, as noted by Lord Kelvin: "There is no device that can transform heat withdrawn from a reservoir completely into work with no other effect". For purposes of calculating resistance to flow of fluids in pipes, essential pipeline components such as valves, filters, dryers etc., have published values corresponding to their resistance to flow expressed as that of the equivalent length of pipe of the same diameter in which they are intended to be fitted. 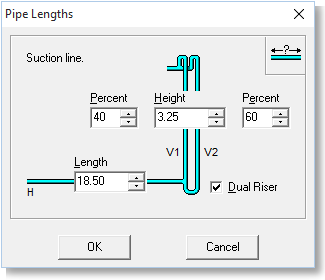 Thus making overall pipework design pressure drops much easier to compute. For example, a particular type of valve, designed to be fitted in a pipe of 1/2” diameter, might be declared by its manufacturers as having an equivalent length of 0.5 metres. Thus when fitted in a pipe with a total length of 8 metres, after fitting the valve, the overall pipe length for purposes of calculating its resistance to fluid flow, and thereby the total pressure drop, would be 8.5 metres. Ester oil is a synthetic base oil that has been chemically synthesized. Typical usage is in vehicle air conditioning compressors, refrigeration compressors and some other industrial applications. Esters are stable molecules, providing good solvency and very good low and high temperature performance. One that gives up heat to its surroundings. Opposite of an endothermic process. In chemistry the phenominon of an alloy or mixture whose melting point is lower than that of any other alloy or mixture of the same ingredients. A heat exchanger in the low pressure side of a refrigeration system in which liquid refrigerant evaporates thus absorbing heat from any medium in close proximity (such as air) so as to create a cooling effect on that medium. A process described under Latent Heat or change of state. Exhaust air is forced out of a space resulting from replacement air that is fed in to that space under pressure. A mixture of substances having a lower melting point than any of its constituents. A valve, orifice, or capillary tube installed in a refrigerant tube immediately ahead of the evaporator. Designed to create a pressure drop and thus force refrigerant liquid to evaporate to its vapour stage. Extract air is drawn out of a space under lower pressure than air in that space. Air is fed or directed in to that space to replace it. Fahrenheit temperature scale, still commonly used in the United States, devised by Daniel Gabriel Fahrenheit (1686-1736), Dutch-German physicist, engineer and maker of scientific instruments such as the alcohol thermometer (1709) and mercury thermometer (1714). A line plotted on a chart which indicates mechanical fan (air mover) performance in terms of relationships between air volume, rotational fan speed (RPM), Static Pressure and (usually) fan power absorbed. The design and arrangement of windows in a building or structure. States that heat is energy. In metallurgy, a flux is a chemical cleaning agent and a flowing agent (or purifying agent). Flux has more than one function in the high-temperature metal joining processes of welding, brazing and soldering. The primary purpose of flux is to prevent oxidation of the base and filler materials by creating a barrier to oxygen. Secondly flux act as a chemical cleaning agent removing existing oxides, oils and other contaminates that might impede the metal joining process. A partial differential equation for temperature as a function of spatial co-ordinates and time. FPS (fps or feet per second) is used in measurement of velocity in the old Imperial system of units. It is equal to 0.3048 metres per second in SI units. Typically used in measurement of air velocity either in or leaving air ducts and also for fluid flow rates in pipes. The temperature at which a liquid becomes a solid upon removal of its latent heat content. The freezing temperature of water is 0°C (32°F) at atmospheric pressure. An electrochemical device that produces electricity and heat from a fuel (hydrogen and oxygen) without combustion. The process is an 'inverse electrolysis'. Hydrogen and oxygen are catalytically reassociated to water. Fuel cells could power electrical cars if the problem of handling and storage of hydrogen could be solved, possibly using nanotubes. A Gate Valve is a valve fitted in a pipe or tube having a screw operated sliding plate to control flow of fluid. Gate valves can be either manually controlled via hand wheel or lever fitted to the screw mechanism connecting the sliding plate or can be remotely controlled via stepper motors for example. Gauge Pressure is zero-referenced against ambient air pressure, so it is equal to absolute pressure minus atmospheric pressure. Negative signs are usually omitted. To distinguish a negative pressure, the value may be appended with the word "vacuum" or the gauge may be labelled a "vacuum gauge." A kinetically (rather than thermodynamically) conditioned temperature region below which on cooling the molecular mobility greatly decreases as a polymer changes from a rubbery to a glassy state. A Globe Valve is a valve that adjusts the flow of a fluid between and including fully on and fully off. The globe valve consists of a circular plug that is typically operated by a screw mechanism and a tapered seat into which the tapered plug engages. A body that has emissivity less than 1 and independent of wavelength. Hydrocarbons such as methane in which the hydrogen atoms have been replaced by halogen atoms. Where all hydrogen atoms have been replaced the compound is described as fully halogenated. Where only some of the hydrogen atoms have been replaced the compound is described as partially halogenated. Brominated Hydrocarbon. Halons contain bromine, chlorine, fluorine and carbon. Halons have very high ODP factors. Halons are commonly used in fire extinguishing systems and fire extinguishers. Particularly aboard aircraft where their high efficiency to weight ratio makes Halon highly suitable. Production and import in the European Union was phased out from the beginning of 1994. Hydrochlorofluorocarbons. CFCs which have not been fully halogenated so that one or more hydrogen atoms remain in the molecule. HCFCs are more readily decomposed in the troposphere and therefore their ODPs are less than for CFCs. The quantity of heat required to change the temperature of a body by one degree. For a homogeneous body it is the product of mass and specific heat capacity; and for an inhomogeneous body it is the sum of the product of mass and specific heat capacity of all the individual homogeneous components. A Heat Exchanger is any mechanical device that is designed to transfer heat energy from one medium or fluid into another. There are many types of heat exchanger and sizes can vary from the (now) minute Nanotechnological sizes to extremely large Feed Water heaters, for example in Nuclear power station applications. Common heat exchanger designs include fin-coil, as used in evaporators and air cooled condensers, plate heat exchangers, as used for example in the dairy and food industries, shell and tube heat exchangers, as used for oil coolers, particularly in heavy industry and marine applications. Less common, or at least, less well appreciated examples of heat exchangers appear in medical and laboratory applications. Heat exchanger technology extends from the very simple to highly complex items of sophisticated engineering production costing several millions of Pounds (Dollars). It is estimated that heat exchanger use accounts for up to 15% of all mankind's energy manipulation* on the planet and as such is a regrettably grossly misunderstood subject amongst the lay public. Refrigeration and Air Conditioning engineering could not exist or function without Heat Exchangers. Modern civilisation could not exist or function without Refrigeration and Air Conditioning engineering. * Energy can neither be created nor destroyed but can be changed from one state to another and can be moved from one medium (material or fluid) to another. Heat energy always moves from a warmer to a colder medium and continues to do so until temperature equilibrium is reached. In its broadest sense a Heat Pump is any closed circuit refrigerating system designed to move heat energy from one location to another. Either to use it or expel it to another and which exploits the 'Change of State' process to gain an efficiency ratio of energy usage (required to drive the system) appreciably lower than the amount of energy that is moved. In a reversible Heat Pump, when in cooling mode the evaporator performs as an evaporator and similarly the condenser as a condenser. When reversed so as to provide heat instead of cooling then the evaporator performs as a condenser releasing system rejected heat where it is useful, and the condenser performs as the evaporator, absorbing heat from ambient air in order to effect a 'change of state' upon the refrigerant. Heat pumps have found particular favour in countries such as Canada where despite having very low winter ambient air temperatures, a ready supply of electricity from hydro-electric power stations, coupled with large geographic distances making transport of fossil fuels untenable, has made them popular. Heat Pumps are rapidly becoming the most economical and thus popular choice of equipment for heating water in swimming pools. Where, due to both seasonal usage reasons and a relatively high temperature differential between energy source and heat sink (the water) they are relatively efficient. Efficiency ratios of around 4.5:1* are typical in temperate climates. * I.e. For every 1kW of electrical energy consumed to operate the system, 4.5kW heat energy is gained. A system of electrically powered heater elements laid beneath a freezer room floor and controlled by a thermostat to maintain ground in direct contact with the floor structure above the freezing temperature of the moisture it contains. In the absence of which if that ground freezes is likely to increase in volume due to the formation of ice and thus break the floor. A process known as Frost Heave. Despite adding heat to materials in contact with the refrigerated space it is generally acknowledged that floor Heat Mat heat loads should not be added to freezer refrigeration load calculations as the load calculation should anyway be designed to consider mean ground heat content and sub-strata heat transfer coefficients and which will always be higher than heater mat loads. Thus representing a 'worst case' situation for load calculation purposes. In tropical climates, where there is no risk of seasonal air frosts, ducts through which ambient air is forced are sometimes used in place of electrical heater mats so as to serve the same purpose and as a more economical to operate system. Example: Alternating electrical current is supplied to domestic consumers in Europe and some other regions of the world at a frequency of 50 Hz. Meaning alternation at 50 cycles per second. Partially halogenated hydrocarbons containing only fluorine, hydrogen and carbon. HFCs have zero ozone depleting potential. A high pressure switch (HP Switch) is connected to the compressor discharge line to protect the high-pressure side of the system against excessive pressure. The design of the HP Switch is similar to that of the LP Switch. However, whereas the LP Switch is made to close when the suction pressure reaches an upper set limit the HP Switch is made to open when the discharge pressure is too high. The HP Switch is therefore a safety device only and does not control the compressor under normal operating conditions. The HP Switch and LP Switch are frequently combined into a single manufactured unit (HP/LP Switch). Is a material in which the relevant physical properties are uniform throughout the material. A unit of power equal to 33,000 foot pounds of work per minute. One electrical horsepower is equal to 746 watts. Horsepower is commonly abbreviated to the initials HP. A mechanical device used for the introduction of additional moisture into a conditioned space. Humidifiers can take various forms, such as Spinning Disc, where water is effectively vapourised and projected into a space or air duct through Coriolis force (frequently mis-named centrifugal force) from the edges of a disc rotating at high speed, or steam humidifiers or atomizers. Organic substances which contain only hydrogen and carbon. Hygroscopic materials or substances are those that have a tendancy to absorb water vapour from the atmosphere. Oils that are commonly added to refrigerants can be hygroscopic. The system of imperial units or the imperial system (also known as British Imperial) is the system of units first defined in the British Weights and Measures Act of 1824, which was later refined and reduced. The system came into official use across the British Empire. By the late 20th century, most nations of the former empire had officially adopted the metric system as their main system of measurement. However some Imperial units are still used in the United Kingdom and Canada. The United States of America still adheres to an Imperial based system of measurement units. Despite the country being early national signatories to the late 19th century initiative that has ultimately led to almost universal adoption of SI. Inches of water is a non-SI unit for pressure. It was used for measuring small pressure differences across an orifice, or in a pipeline or duct. Inches of water can be converted to a pressure unit using a formula for pressure head. It is the pressure exerted by a column of water of 1 inch in height at defined conditions. For example 1"wg is approximately equal to 249 pascals at the defined conditions of standard atmospheric pressure at sea level at 4°C. A system consisting of a lens transparent to the infrared radiation, a detector and associated electronics giving the user an image of energy in the infrared spectrum. A part of the electromagnetic adjacent to visible light. Approximately from 0.7µm to microwave. The portion of the infrared spectrum that the majority of heat energy is recorded from. This portion of the electromagnetic spectrum is defined as 3µm to microwave. However, most of infrared imaging occurs between 3µm and 14µm. Insolation (an anagram composed of incident or incoming solar radiation) is a measure of solar radiation energy received on a given surface and recorded during a given time. It is also called solar irradiation and expressed as "hourly irradiation" if recorded during an hour or "daily irradiation" if recorded during a day. Insolation is generally measure in megajoules per square metre (MJ/m²) or joules per square millimetre (J/mm²). A material (depending upon type for intended application) that reduces or prevents the transmission of heat or sound or electricity. The Institute was founded in England in 1899 as the Cold Storage and Ice Association and was the first national society of mechanical refrigeration in the world. In 1944 qualified membership was introduced in order to raise the status of the association and of those engaged in the science and practice of refrigeration, and the present name of the Institute of Refrigeration was adopted. The IOR is registered with the Charity Commission of the United Kingdom as an educational and scientific body (reg no 250 081). It is governed by an elected Council of Members who act as Charity Trustees. The relationship between two or more compounds, radicals, or ions that are composed of the same kinds and numbers of atoms but differ from each other in structural arrangement (structural isomerism) as with CH 3 OCH 3 and CH 3 CH 2 OH for example. One in which the propagation of heat (or electric current or electromagnetic waves) does not depend on direction of propagation. Joule the SI unit for energy. 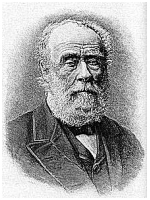 The joule (J), named in honour of James Prescott Joule and his experiments on the mechanical equivalent of heat. In fundamental terms, 1 Joule is equal to 1 Newton-metre. In physics, thermal conductivity (often denoted k or K) is the property of a material to conduct heat. It is evaluated primarily in terms of Fourier's Law* for heat conduction. * Named after the French Mathematician and Physicist Jean Baptiste Joseph Fourier. K factor is the essential component used in the equation including material thickness and necessary for calculating U value. Needed to calculate the rate at which heat energy passes through a given material, always from a higher temperature source or region to a lower temperature region*. As for example when energy in ambient air at a relatively higher temperature passes through construction materials and insulation into a closed space that has been designed to be held at a lower temperature. For 75mm thickness Polyurethane Foam insulation. *A common misconception, particularly amongst the inadequately educated, is that insulation 'keeps the cold out'. A scientific nonsense as 'cold' is a word used merely to describe the absence (or to be more precise, the relatively lower amount when compared to another region) of heat energy. Cold is therefore not a property which can be 'kept out'! The Kelvin is a unit of measurement for temperature. One of the seven base units in the International System of Units (SI). The Kelvin is assigned the unit symbol K. The Kelvin scale is an absolute, thermodynamic temperature scale using as its null point Absolute Zero, the temperature at which all thermal motion ceases in the basic description of thermodynamics. Kinetic energy of an object is the energy which it possesses due to its motion. It is defined as the work needed to accelerate a body of a given mass from rest to its stated velocity. Having gained this energy during its acceleration, the body maintains this kinetic energy unless its velocity changes. The same amount of work is done by the body in decelerating from its current velocity to a state of rest. 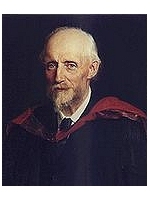 William Thomson Lord Kelvin was credited with introducing the word Kinetic to describe this physical phenomenon. Laminar flow describes the movement of a fluid through a pipe or duct where the direction of the major part of the fluid is parallel to the wall surfaces of the pipe or duct. At higher velocities, friction between the moving fluid and the surface material of the pipe or duct causes drag and thus slowing of the fluid closest to the wall. The remaining fluid, further away from that effected by drag subsequently creates eddies and currents described as turbulent flow and which add to the overall resistance to flow through the pipe or duct. Problems of turbulent flow are usually exacerbated in the proximity of bends and take-offs (Tees) in the pipe or duct. The unwelcome additional pressure drop resulting from turbulent flow can sometimes be mitigated in air ducts for example by the installation of air turning vanes, which separate air flow into multiple channels and also encourage more orderly flow which more closely resembles the characteristics of laminar flow. Latent heat is the energy released or absorbed by a body or a thermodynamic system during a constant-temperature process. A typical example is a change of state of matter, meaning a phase transition such as the melting of ice or the boiling of water. 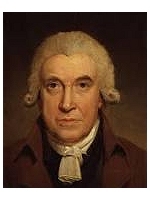 The term was introduced around 1762 by Scottish chemist Joseph Black. It is derived from the Latin latere (to lie hidden). Black used the term in the context of calorimetry when referring to the heat transferred that caused a change of volume while the thermodynamic system was held at constant temperature. In contrast to latent heat, an energy is called a sensible energy or heat when it causes processes that do result in a change of the temperature of the system. Born Bordeaux, France. 1728 (nationality Scottish). A liquid receiver is commonly used in refrigeration systems that uses a thermostatic expansion valve as a metering device. The main purpose of a liquid receiver is to temporarily store excess refrigerant in its liquid state that is not required when load conditions are low. Thermostatic expansion valves need a constant supply of refrigerant in its liquid form at all times and the liquid receivers ensures that supply. The low pressure switch (LP Switch) is also known as a Suction Pressure Control Switch. The LP Switch is the control normally used to switch, typically via a relay, operation of refrigeration compressor and thus the complete system. The LP Switch is connected to the suction side of the compressor and is activated by pressure changes in the suction line. The LP Switch and HP Switch are frequently combined into a single manufactured unit (HP/LP Switch). The temperature at which a solid changes into a liquid. The melting point depends on pressure (Clausius-Clapeyron law). Meteorology is the science dealing with the atmosphere and its phenomena, including climate and weather. Comprehensive local meteorological data is fundamental to the accurate calculation of both refrigeration and air conditioning heat loads. An enthalpy–entropy chart which plots total heat against entropy. Describing the enthalpy of a thermodynamic system. Property data for the Mollier diagram is identical to that on a psychrometric chart. However the arrangement of data on the two chart types is fundamentally different. Named after Richard Mollier, German Physicist. Is the creation of materials, devices, and systems on the nanoscale (up to 100 nm) through the manipulation of individual atoms and molecules. Tubelike molecules of carbon (diameter about 10,000 times smaller than a human hair) consisting of graphite sheets, being extremely strong materials with high thermal conductivity. Nanotubes can be single walled or multiwalled (composed of one or several sheets in a concentric formation). Nanotubes may have no 'temperature'. A Needle Valve is a valve that adjusts the flow of a fluid between and including fully on and fully off. The needle valve consists of a sharp conical obstruction that is extended or retracted, usually via a screw mechanism, to obstruct or allow flow. Needle valves are typically used in applications that demand fine control over flow, such as for metering additions of one fluid to another for example. The newton (symbol: N) is the International System of Units (SI) derived unit of force. 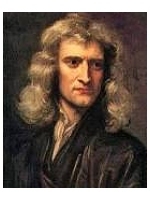 It is named after Sir Isaac Newton following his work on mechanics, specifically Newton's second law of motion. Measuring temperature of a body without touching it (for example measuring the temperature of the sun by a pyrometer). 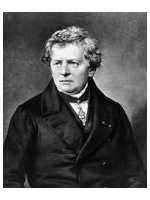 The ohm (symbol: ) is the SI derived unit of electrical resistance, named after German physicist Georg Simon Ohm. The ohm is defined as a resistance between two points of a conductor when a constant potential difference of 1.0 volt, applied to these points, produces in the conductor a current of 1.0 ampere, the conductor not being the seat of any electromotive force. Caused by passing electric current through a resistor (e.g. an electric heater). The ozone depletion potential (commonly abbreviated to intials ODP) of a chemical compound is the relative amount of degradation to the ozone layer it can cause, with trichlorofluoromethane (R11) being fixed at an ODP reference level of 1.0. In comparison for example Chlorodifluoromethane (R22) has an ODP of 0.055. R11 has the maximum potential amongst chlorocarbons because of the presence of three chlorine atoms in its molecule. ODP was first proposed in 1983. It was defined as a measure of the destructive effects of a substance compared to the reference substance. The ODP of a substance is defined as the ratio of global loss of ozone compared to the global loss of ozone due to R11 of the same mass. Discovery of ozone depletion in the stratosphere with its resultant reduced ability to limit passing of potentially hazardous Ultra-Violet (UVA) radiation to the planet's surface led directly to the formation in 1987 of a United Nation's treaty called the Montreal Protocol and which came into force in 1989. The Montreal Protocol called for the ultimate phase out of production and effective banning of all Chlorofluorocarbons (CFCs) including Hydrochlorofluorocarbons (HCFCs), by 2030. The Montreal Protocol was the first treaty in history to be universally ratified by all member states of the United Nations. 800  × 1200  × 145 	31.50 × 47.24 × 5.71 	ISO1 same size as EUR 1. safe load: 2490 kg. 1200  × 1000  × 144  	47.24 × 39.37 × 5.67 	ISO2 same size as EUR 2. Safe load: 1470 kg. 1000  × 1200  × 144  	39.37 × 47.24 × 5.67 	Safe load: 1920 kg. The pascal (symbol: Pa) is the SI unit of pressure. 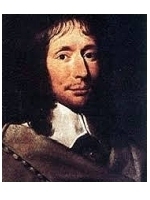 Named after the French mathematician, physicist and philosopher Blaise Pascal. It is a measure of force per unit area. Defined as one newton per square metre. The older and now internationally virtually obsolete* unit commonly used for defining pressure was pound per square inch (psi). * Except in the USA. hectopascal (1 hPa = 100 Pa). kilopascal (1 kPa = 1000 Pa). megapascal (1 MPa = 1,000,000 Pa). Usually a cooling element utilising the Peltier effect, used to cool or refrigerate small objects. A change in temperature at the junction of two different metals or semiconductors produced when an electric current flows through them. The extent of the change depends on what the conductors are and the nature of change (rise or fall in temperature) depends on the direction of current flow. It is the reverse of the Seebeck effect. 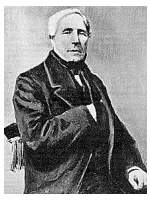 It is named after the French physicist Jean Charles Peltier (1785–1845) who discovered it in 1834. A representation of the regions and boundaries of existence of various phases of a physico-chemical system depending on one or more thermodynamic quantities, such as temperature, pressure or concentration. Was formulated in 1900 by Max Planck, a German physicist, to explain the spectral-energy distribution of radiation emitted by a blackbody. Born: Kiel, Duchy of Holstein, 1858. Died: Göttingen, Lower Saxony, Germany, 1947. A thermometer with a sensor made of a thin layer of platinum based material whose resistance increases with temperature. See also - resistance thermometer. A plenum is a space, or chamber, frequently fabricated from sheet metal but also can be made as part of a building structure, designed to receive air returning through connected ducts that has been extracted or exhausted from heated or conditioned spaces via return air registers (grilles) or has the reverse role and is designed to be pressurized to serve connecting ducts transferring heated or conditioned air to individual spaces or supply air grilles. The final connection of the plenum would generally be to an air handling unit, usually in close proximity. A Pressure Relief Valve is a (usually) non-adjustable control valve that regulates pressure in any pressurised fluid pipe system. Applications include safety valves designed to protect equipment from the damaging effects of uncontrolled excessive pressure. Which, in extreme cases could otherwise result in hazardous explosions. A chart showing the relationship between temperature, pressure and moisture content of air or other specifically named gases. A Pycnometer is a simple container, usually made of glass, used for finding the relative density of a liquid by measuring its net weight when filled with the liquid and comparing it with the net weight when filled with pure water at its maximum density (that is when the pure water is at a temperature of 4°C). Instrument for detecting temperature using infrared radiation. The speed at which a sprayed liquid or solid particle cools upon striking a cold surface. The rate of radiant energy emitted from unit area of a surface in all directions into the hemisphere of space above the surface. 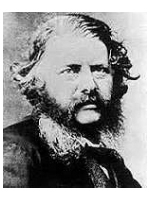 Rankine is a thermodynamic (absolute) temperature scale named after the Glasgow University engineer and physicist William John Macquorn Rankine, who proposed it in 1859. The symbol for degrees Rankine is °R. Zero Rankine is Absolute Zero. The Rankine degree is defined as equal to one degree Fahrenheit. A temperature of -459.67°F is exactly equal to 0°R. Now an obsolete temperature scale created by R A F de Réaumur (1683-1757) a French scientist. He used the freezing point of water as his zero mark, and put the boiling point at 80 degrees. The ratio of reflected power to incident power, expressed in decibels or percentage. The terms reflectivity and reflectance are often used interchangeably, although there is a difference between the two terms. Reflectance is a measurement of the amount of light that is reflected by a coating at a given film thickness. Reflecti­vity is the maximum amount of light that can be reflected by the coating; no further increase in coating film thickness or smoothness will increase the value. A chemical substance used in a mechanical refrigeration system to absorb heat in an evaporator by change of state from a liquid to a gas, and to release that heat in a condenser as the substance returns from its gaseous state back to its liquid state. Refrigeration may be defined as lowering the temperature of an enclosed space by removing heat from that space and transferring it elsewhere. Typically removing heat from an enclosed and thermally insulated space, such as a coldroom or freezer room, along with heat from items placed in that space, to ambient air. In coldstore (coldroom) design the sum of structural, product (typically food product) and miscellaneous heat loads such as from personnel, lighting and machinery etc., are known as the Primary Refrigeration Load. However the time available over a 24 hour period for the refrigeration system to meet the Primary Refrigeration Load duty is less then 24 hours. This is because a time period has to be set aside for removal of ice build up from cooler surfaces. A process known as defrosting. Defrost time periods are determined with consideration for a number of factors. These include design operating temperatures, TD (temperature differences between design operating temperature and refrigerant evaporating temperature, expected humidity ratios in the refrigerated space and which itself may be a function of the type of product to be stored. However typical defrost periods, in temperate climates at least are generally set at around 8 hours in a 24 hour period for 'off-cycle' defrost systems as usually designed for relatively higher temperature storage applicable for chillers and coldrooms, and 6 hours in any 24 hour period for powered defrost systems designed for freezers which operate at lower temperatures. The addition of the essential time periods for defrost is frequently described as Running Load. For powered defrost systems, where either relatively warmer refrigerant gas is directed through tubes in evaporators to remove ice or in electric defrost systems where electrically powered heater elements are used for the same purpose, it is generally considered that there is no need to include the heat created by these systems as this is added to the ice melt water and which is always routed away to outside of the refrigerated space. This is not entirely factual however as inevitably some heat will be added to the refrigerated space but empirical observations have determined that in a properly designed and controlled powered defrost system, the amounts of additional heat energy involved are not worthy of consideration. Therefore the simple expedient of multiplying Primary Refrigeration Load by a factor of 24 over 16 for chillers and coldrooms and a factor of 24 over 18 for freezers is generally applied to arrive at what is described as the Preliminary Refrigeration Load. Finally, where fan-coil units fitted with electrically powered fan motors are used and which is the most common form of cooling equipment fitted inside coldrooms and freezer rooms, consideration must be given to adding the heat generated by the cooler fan motors themselves. This can add as much as circa 5% of the Preliminary Refrigeration Load and it is important not to ignore it. The sum of Preliminary Refrigeration Load and Cooler Fan Load is the Total Refrigeration Load and it is that duty which the refrigeration system has to meet before other considerations such as work heat from compressors for example are also added. The addition of which to the Total refrigeration Load becomes the Total Heat of Rejection and which is what the condensers in the system are required to reject to either ambient air or some other cooling medium outside the refrigerated space. However, manufacturers' fan coil unit design can vary considerably in efficiency and therefore the final actual figure might not be known until after suitable coolers have been provisionally selected. If, once cooler fan load additions are known, the resultant net duty of the coolers is reduced by much more than 5% of Total Refrigeration Load then the provisional cooler selection should be abandoned and a slightly larger cooler selection made. Although this might initially appear to be a seemingly trivial consideration by the time further system inefficiencies resulting from unfavourable calculations have been made it can become much more important to design viability. The ratio of the amount of water vapour present in air compared to the greatest possible amount at the same temperature. A device, usually consisting of an electromagnet and an armature, by which a change of current or voltage in one circuit is used to make or break a connection in another circuit or to affect the operation of other devices in the same or another circuit. Relays are typically used for indirect switching of electrical loads in circuits where direct switching would impose loads too high for that part of the circuit or of another circuit to sustain. A sensing element the resistivity of which changes with temperature. The sensing element can be a conductor (RTD) or a semiconductor (thermistor). Both fresh fruit and fresh vegetables are live products and they continue to respire after harvesting at varying rates depending upon species, condition (ripeness) and storage temperature. During respiration fructose combines in an exothermic reaction with oxygen to produce carbon dioxide and water. Heat, described as heat of respiration, is released during the reaction and this adds energy to the refrigeration load of fruit and vegetable chilled storage rooms. In fluid mechanics, the Reynolds number (Symbol Re) is a dimensionless[*] quantity that is used to help predict similar flow patterns in different fluid flow situations. The concept was introduced by George Gabriel Stokes in 1851 but the Reynolds number is named after Osborne Reynolds (1842–1912) who popularised its use in 1883. Born Skreen, County Sligo, Ireland 1819. The Reynolds number is defined as the ratio of inertial forces to viscous forces and consequently quantifies the relative importance of these two types of forces for given flow conditions. [*] A dimensionless quantity (or quantity of dimension 1) is a quantity without an associated physical dimension. It is thus a "pure" number and as such always has a dimension of 1. Dimensionless quantities are widely used in mathematics, physics, engineering, economics, and in everyday life (such as in counting). Numerous examples of dimensionless quantities exist, such as (Pi). By contrast, non-dimensionless quantities are measured in units of length, area, time, volume etc. RPM is the standard abbreviation for Revolutions per Minute, used to define the rotational speed of machinery such as motors, compressors and fans. In refrigeration, coldstores (coldrooms) and freezers utilise evaporators (fan coil units or unit coolers) to extract heat energy from the refrigerated space. The process of cooling air inside the refrigerated space results in air temperature falling to its dew point with the result that water forms on external surfaces of the cooler. Where refrigerant evaporating temperaures are below 0°C this water freezes to form what is called frost. Frost impedes the efficiency of the cooler and also obstructs air flow in fan-coil units and thus must be periodically removed in a process described as defrosting. The time periods set aside are scheduled, usually by means of an electronic clock and the sum total of these timed periods is known as the Running Load. Evaporation in a closed container will proceed until there are as many molecules returning to the liquid as there are escaping. At this point the vapour is saturated and the pressure of that vapour is the saturated vapour pressure. Since the molecular kinetic energy increases with temperature, more molecules can escape the surface and the saturated vapour pressure increases. If the liquid is open to the air then the vapour pressure is a partial pressure contributing to the total pressure along with the other gases in the air. The temperature at which the vapour pressure is equal to the atmospheric pressure is the boiling point. An atomic force microscope with an integrated sensor to detect local variations in the thermal conductivity. States that not all heat energy can be recovered from a body (Lord Kelvin's formulation). An alternative formulation (E. Clausius) is that heat can flow from a colder body to a warmer body only at the expenditure of extra non-thermal energy (as in a mechanical refrigerator). The second law of thermodynamics states that entropy always increases with time. Generation of a voltage in a circuit containing two different metals, or semiconductors, by keeping the junctions between them at different temperatures. 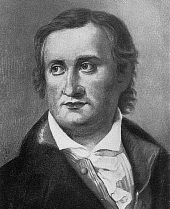 Discovered by the German physicist Thomas Seebeck (1770–1831), it is also called the thermoelectric effect, and is the basis of the thermocouple. It is the opposite of the Peltier effect (in which current flow causes a temperature difference between the junctions of different metals). Sensible heat is heat exchanged by a body or thermodynamic system that has as its sole effect a change of temperature. The term is used in contrast to a latent heat, which is the amount of heat exchanged that is hidden, meaning it occurs without change of temperature. For example, during a phase change such as the melting of ice, the temperature of the system containing the ice and the liquid is constant until all ice has melted. The sensible heat of a thermodynamic process may be calculated as the product of the body's mass (m) with its specific heat capacity (c) and the change in temperature (Delta T). Sensible Heat Ratio - SHR is defined as the sensible heat or cooling load divided by the total heat or cooling load. SI comprises a coherent system of units of measurement built around seven base units, plus twenty two named and an indeterminate number of unnamed coherent derived units. Along with a set of prefixes that act as decimal-based multipliers. The second of time, kelvin and kilogram are defined independently of any other base units. The metre is defined in terms of the speed of light, so depends upon the definition of the second. The definitions of the other base units are more complicated. The weight of a liquid compared to water* and which is assigned the index value of 1. In science the relationship of mass to volume is usually expressed directly in terms of the density of a substance (mass per unit volume). In industry specific gravity finds wider application. * Pure water at its densest, which is at a temperature of 4°C (39.2°F). The Specific Gravity of pure alcohol at 25°C (ethanol, as found in alcoholic beverages) is 0.787. Therefore less dense (lower mass) than pure water. The Specific Gravity of typical seawater, having a salinity of 3.5% and also containing other dissolved substances, is about 1.025 at 25°C. Therefore more dense (higher mass) than pure water. An instrument especially designed for the purpose of accurately determining the Specific Gravity of a liquid is a vessel called a Pycnometer. Sight glasses effectively provide a small 'window' allowing visual inspection of part of a closed cycle refrigerant pipe system. Sight glasses are commonly also fitted with a chemically coated component (disc around the glass periphery) that is designed to change colour to indicate the presence of unwanted and potentially damaging moisture in the system. In theory sight glasses can be fitted at any desired location in the liquid line. However, placing a sight glass close to the expansion valve is advisable. A standard sight glass with an indicator has a dual function. It monitors whether the moisture content of the refrigerant is within an acceptable range and it also indicates whether liquid refrigerant is always present at the expansion component. If moisture content is within acceptable limits a colour indicator colour (commonly green) shows that no further action is necessary. If the indicator colour changes (commonly to yellow) then this shows a problem with excess moisture content in the system. Excessive moisture content can cause icing of the expansion valve if the evaporating temperature is 0 °C or lower. In addition, excessive moisture in the system can react with the oil normally used in modern refrigeration systems (polyester oil) to form acids. Frothing in sight glasses indicates either a shortage of refrigerant or that refrigerant in the liquid line is not entirely in the liquid state. Soldering is a process in which two or more metal items are joined together by melting and flowing a filler metal (solder) into the joint. The solder having a lower melting point than the metals to be joined. Soldering differs from welding in that the process does not involve melting the metals to be joined. In brazing the filler metal melts at a higher temperature than for soldering but again the metals to be joined do not melt. A Solenoid comprises a coil of wire, partially surrounding an iron core, that is made to move laterally inside the coil by a magnetic field created by passing an electrical current through the coil of wire. Solenoids are used to convert electrical to mechanical energy. For indirect operation of switches for example and where direct operation would impose electrical loads too high for the switching circuit to sustain. Solenoids are also used for simple mechanical activation of equipment such as (relatively small) valves controlling liquid flow or for dampers in air ducts and where mechanical loads are not sufficiently high as to warrent application of more expensive or complicated motor driven systems. Specific Enthalpy is the total energy in a system due to pressure and temperature per unit of mass in that system. Specific enthalpy is used in thermodynamic equations when one wants to know the energy for a given single unit mass of a substance. The SI units for specific enthalpy are kJ/kg (kilojoules per kilogram). The Imperial units for specific enthalpy are Btu/lb (British thermal units per Pound). The SI units for specific entropy are joule/kg K (joule per kilogram Kelvin), more commonly kilojoule/kg K (kilojoule per kilogram Kelvin). The Imperial units for specific entropy are Btu/Pound °R (British thermal unit per Pound Rankine). The volume per unit of mass of a substance. The standard SI unit is the metre cubed per kilogram (m³/kg). The standard Imperial unit is the cubic foot per pound (ft³/lb). Static Pressure is the expression used to distinguish pressure of a fluid from its total and dynamic pressures. The actual pressure of the fluid, which is associated not with its motion but with its state. Static Pressure is used for example to refer to pressure at a nominated depth in a fluid. In heat transfer, the condition in which the temperature at any given point in a material or material system is independent of time, to a given precision for a specified time period. Stefan-Boltzmann equation determines radiation emitted over all wavelengths at a particular temperature. A stepper motor is a brushless DC (direct current) electric motor that divides its full rotation into a number of defined steps. The motor can be energised to move and hold its position at any one of these steps. Typical applications include remote control of a valve across a range of opening settings and where control is initiated by a temperature sensing device and then transmitted to the stepper motor via relays for example. A stepper motor might be used in applications where a simpler and generally smalled solenoid operated control system might be insufficiently powerful or too simplistic. Solenoids being better suited to either 'all on' or 'all off' ('fully open' or 'fully closed') operating functions. The region of the earth’s atmosphere extending from the top of the troposphere (a height of about 10km) to about 50km. The stratosphere is characterised by the presence of relatively high concentrations of ozone. The cooling of liquid below the temperature at which it condenses from its gaseous state. The tube that carries refrigerant gas from the evaporator to the compressor in a closed circuit refrigeration system. A suction-line accumulator is a safety device used on a refrigeration system to prevent liquid refrigerant from returning to the compressor. A suction-line accumulator typically takes the form of a cylindrical, sealed, pressure vessel, fabricated from welded sheet steel. The temperature of a vapour above the boiling temperature of its liquid state at the same pressure. The measurement, using a system of equally incremental degrees, of the effect of a given quantity of heat energy present in a given mass of a material or substance. Temperature for an identical amount of energy in two or more compared materials or substances of identical mass may vary depending upon the Specific Heat property of each the materials or substances. Kelvin. Range 0 with 0 at the point at which no heat energy is present in the classical sense, to infinity. Degrees Celsius (°C). Range -273.15°C [approx.] = 0 Kelvin, to infinity. Degrees Centigrade (°C). As Celsius although now largely obsolete except in Meteorology. Rankine. Range 0 with 0 at the point at which no heat energy is present in the classical sense. to infinity. Degrees Fahrenheit (°F). Range -459.67°F at the point at which no heat energy is present in the classical sense, to infinity. Temperature glide is the temperature difference that occurs between the vapour state and liquid state during evaporation or condensation at constant pressure. Meaning the temperature in the evaporator and condenser is not constant. Temperature glide occurs in near-azeotropic and zeotropic mixtures. Temperature glide is the temperature difference between the bubble point and dew point temperatures. TEWI was the jargon anagram devised in the late 20th century meaning Total Equivalent Warming Impact. Proponents of TEWI, who believed that causes for possible Global Warming were anthropological (due to human industrial and lifestyle activity), aimed to measure and then control all of the potential heat emissions, along with all theoretically potentially environmentally damaging gases, emanating not just from the manufacture and use of modern equipment essential to civilisation and even to human survival (such as refrigeration), but also to include the effects of its manufacture as well. Taken to its logical conclusion this could also be taken to include even the power consumed by the machinery involved in excavation and transporting the ore used to manufacture the metals from which the equipment was actually manufactured. Then to dismantle, transport, smelt, recover and remanufacture useful materials at the end of the equipment’s normal working life span. However proponents of TEWI probably had not given much thought in advance about the impossible extent of their postulations and thus the infinitely escalating complexity of the subject. Even extensive and expensive to develop computer modelling turned out to be hopelessly inaccurate and thus meaningless. The amount of time wasted in devotion to it, to say nothing of that wasted by others expected to observe it, gradually saw interest in TEWI wane for all but hardened and typically ‘culture of envy’ motivated theoretical ‘environmentalists’. The quantity of heat equivalent to 100,000 British Thermal Units (Btu). Equal to 105,506 kilojoules. Is the property of a material describing its ability to conduct heat. Its unit of measurement is Wm-1K-1 because thermal conductivity is numerically equal to thermal flux density (Wm-2) through an isothermal surface caused by a unit temperature gradient (Km-1). Is a combination of properties (thermal conductivity, heat capacity and density) that indicates how rapidly heat is conducted in a material. Its unit of measurement is m2s-1. A Thermocouple is a device that consists of the junction of two dissimilar metallic conductors, as copper and iron, in which an electromotive force is induced when the conductors are maintained at different temperatures, the force being related to the temperature difference: used to determine the temperature of a third substance by connecting it to the junction of the metals and measuring the electromotive force produced. An instrument for measuring temperature of a body or a medium. A thermometer consists of a sensor (temperature sensing element) and a readout instrument i.e. a display device and connecting leads. The principle is that some property of the sensor changes with the temperature. The range of techniques is extensive: the expansion of a liquid, the change of gas pressure, the change of electrical quantity (resistance, voltage), the radiation change, etc. The temperature measurement may be done by contact with the medium or non-contact. Thermostatic expansion valves (typically abbreviated to TEV, TXV, or TX valve) are metering devices that control the amount of refrigerant flow into an evaporator. Thus controlling amount of superheat at the outlet of the evaporator and thereby enhancing system efficiency. Flow control, or metering of the refrigerant, is accomplished by use of a temperature sensing bulb fitted to the suction line close to the point where the suction line is connected to the evaporator. The bulb is filled with a gas, having similar properties to that as used in the system, that causes the valve to open against spring pressure in the valve body as the temperature of the bulb increases. As suction line temperature decreases this causes the spring to act upon the valve to close it. Postulates that it is impossible to cool a body to absolute zero by any finite process. Although one can approach absolute zero as closely as one desires, one cannot reach it. 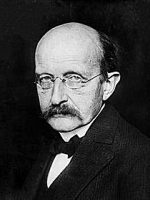 Walter Nernst formulated this law also known as the Nernst heat theorem. 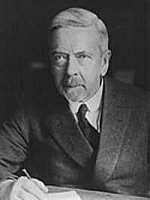 Walther Hermann Nernst. German physical chemist and physicist known for his theories behind the calculation of chemical affinity as embodied in the third law of thermodynamics for which he won the 1920 Nobel Prize in chemistry. 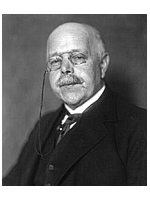 Walther Nernst helped establish the modern field of physical chemistry and contributed to electrochemistry, thermodynamics, solid state chemistry and photochemistry. He is also known for developing the Nernst equation. Born Briesen, West Prussia, 1864. Died Zibelle, Lusatia, Germany 1941. A Thyristor is a semiconductor device having two stable states. Thyristors are used in electrical circuits as electronic switches to control relays. A Ton of Refrigeration (commonly abbreviated as TR) is a unit of power used in some countries (especially in North America) to describe the heat extraction capacity of refrigeration and air conditioning equipment. It is defined as the latent heat absorbed by melting a short ton* of pure ice at 0°C (32°F) in 24 hours. It is equivalent to a mechanical system that consumes (or melts) one short ton of ice per day. The term originated during the transition from stored natural ice to mechanical refrigeration at the end of the 19th century. A Refrigeration Ton is approximately equivalent to 12,000 Btu per hour or 3,517 Watts. The total steady-state heat flow from (or to) a body to (or from) its surroundings by conduction, convection and radiation and is expressed as the time rate of heat flow per unit area of the body surface per unit temperature difference between the body and its surroundings. Triple point of water (TPW) - The single combination of pressure and temperature at which water, ice, and water vapour can coexist in a stable equilibrium occurs at exactly 273.16 kelvins (0.01 °C) and a pressure of 611.73 pascals (ca. 6 millibars). At that point, it is possible to change all of the substance to ice, water, or steam by making infinitesimally small changes in pressure and temperature. The temperature and pressure at which three phases (gas, liquid, and solid) of a substance may coexist in thermodynamic equilibrium. Turning vanes are aerodynamic devices installed inside air ducts at unavoidably abrupt changes of direction, where large radius bends are impractical due to space limitations, to help minimise turbulence and thus reduce resistance to air flow. R = 8.3144 J K-1 mol-1. The universal gas constant is the constant R appearing in the ideal gas law pV=nRT, where p is pressure, V is volume, n is number of moles of gas and T is absolute temperature. The universal gas constant is defined in terms of Boltzmann's constant k as R=kNA where NA is Avogadro's number. A quantity in building construction quantifying the insulating properties of walls, windows and other structures. The reciprocal of the U-value is the thermal resistance or R-Value. The lower the U-value number, the greater the heat transfer resistance (insulating) characteristics of the material or assembly of materials. Low U-values (down to 0.1 Wm-2°C-1) are achievable using special insulating materials and techniques. A mechanical device for removing as far as is possible air in a closed system. The moisture content in air can be highly damaging to a piped closed circuit refrigeration system and therefore as much as possible of the air containing that moisture must first removed before the initial charging of the system with refrigerant. A central air conditioning system which works on the principle of supplying constant temperature air volume to a space and by varying the air volume controls room temperature. Viscosity is a fluid's resistance to flow. As temperature increases fluid viscosity (normally) decreases. If fluid viscosity is very high, as with pitch for example then the fluid can even appear to be a solid. A liquid whose viscosity is less than that for water is known as a mobile liquid, while a substance with a viscosity substantially greater than water is called a viscous liquid. A unit for the measurement of dynamic viscosity of fluids is the poise (P). 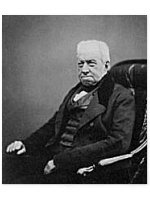 Named after French physicist Jean Léonard Marie Poiseuille. The poise is more commonly expressed as centipoise (cP). Water at 20 °C has a viscosity of 1.0020 cP. In lay terms. The more resistant to flow then the 'thicker' a liquid is, the higher viscosity it has, and correspondingly therefore a higher cP value. Named after Alessandro Giuseppe Antonio Anastasio Volta, eminent Italian physicist and professor, Alessandro Giuseppe Antonio Anastasio Volta (Alessandro Volta). A direct expansion, central air conditioning system providing both heating and cooling. Operating on the principle of varying the flow of refrigerant to a room terminal unit so as to achieve required room temperature. The Watt (symbol:W) is a derived unit of power in the International System of Units (SI), named after the Scottish engineer James Watt. The unit, defined as one Joule per second, measures the rate of energy conversion or transfer. Watt second is a unit of energy equal to 1 Joule. One Kilowatt hour = 3,600,000 watt seconds. The standard unit of power in the International System of Units (SI), equivalent to one joule per second and equal to the power in a circuit in which a current of one ampere flows across a potential difference of one volt. 1 Watt = 3.142 Btu/hour (approx). 1 kilowatt = 1.34 horsepower (approx). 1 kilowatt = 3,412 Btu/hour (approx). Welding is a process for permanently joining materials, usually metals or thermoplastics, by causing coalescence (fusing together). This is often done by melting the workpieces in the vicinity of the intended joint and adding a filler material to form a pool of molten material (weld pool) that cools to become a strong joint (weld). Welding is unlike either soldering or brazing of metals both of which involve melting a lower melting point material between the workpieces to form a bond between them but without melting the work pieces. An instrument used for the measurement of relative humidity in air. Evaporation of moisture surrounding the bulb of the thermometer lowers the temperature indicated compared to that indicated by a dry bulb temperature mounted or deployed in the same space. States that the ratio of the thermal conductivity to the electrical conductivity of a metal is proportional to the temperature. This is because heat and electrical transport both involve free electrons in the metal. The thermal conductivity increases with the average particle velocity since that increases the transport of energy. However, the electrical conductivity decreases with increasing electron velocity because the collisions hinder the electrons from transport of charge. This means that the ratio of thermal to electrical conductivity depends upon the average velocity squared, which is proportional to the kinetic temperature. Slang expression, possibly originating in the USA, used to describe small, self contained air conditioning units that are typically installed in window openings in buildings. An inexpensive and quick solution to providing a simple air cooling system of around 2kW or 3kW sensible cooling duty. So named because of a propensity of the design to create local referred vibration in adjacent surfaces and materials, especially when badly installed. Increasingly now becoming banned by local government departments with responsibilities for maintaining both visually aesthetic and safe* environments for the communities they serve. *'Window rattlers' also have a dubious reputation for falling out and killing or injuring pedestrians passing below! A zeotrope is a mixture made up of two or more refrigerants with different boiling points. Zeotropic mixtures are similar to near-azeotropic mixtures with the exception of having a temperature glide greater than 5.5°C. Zeotropic mixtures should be charged in the liquid state. Law of thermodynamics states that if two systems are at the same time in thermal equilibrium with a third system, they are in thermal equilibrium with each other. Mistral series of refrigeration and A/C load calculation programs are successors to earlier and highly popular DOS based computer programs and were researched between the years 1984 to 2019 by staff at Mistral Associates. They were developed by a team led by Richard Hosking BSc(Hons) Program Development Manager and under the direction of Chris Smith MCIM MInstR Managing Director. Programs are based upon proven calculation methods, including established factors, constants and algorithms in the public domain. All Mistral computer programs are designed in accordance with good practice rules for the industry. Calculation processes may consider any number of parameters including (but not limited to) refrigerant mass flow, temperatures, pressures, viscosity, pipe surface roughness factors, refrigerant turbulent and laminar flow characteristics, acceptable noise levels, safe oil return, efficient compressor operation, system penalties and other system efficiency losses, heat transfer coefficients, thermal properties, plus additional, corroborated, empirical and meteorological data in order to arrive at accurate results. As with all Mistral computer programs for Professionals in the Refrigeration and Air Conditioning industry these programs have been subjected to rigorous testing and quality checks at key commercial and educational establishments around the world. Mistral takes care to ensure that any data contained by its programs either fall within the domain of public ownership or where this is not the case then all legitimate rights have been respected and royalties duly paid. No part of the programs, their code, unique processes or graphical images may be copied or reproduced in any form, whether electronic, printed or by any other means, without the prior express written permission of Mistral Associates, except for reproduction of printable program calculation and capital equipment selection results and associated images as clearly intended to be a programmed function and user benefit of use of the programs.